Government Transparency. Criminal Justice Reforms. Education Policy. Free Speech. ATLANTA, GEORGIA, USA, March 18, 2019 /EINPresswire.com/ — The Georgia Public Policy Foundation hosts about a dozen events a year in metro Atlanta and across the state, inviting state and national issue experts to share free-market, limited-government news and views at Leadership Breakfasts, Policy Briefing Luncheons and Happy Hour policy events. These events are open to the public and media. * Registration is required; the registration fee covers the cost of the event for the Foundation, a state-focused, nonprofit, public policy research and education organization. Wednesday, April 10: “Education Choice: A Case Study in Policy and Politics,” a Foundation Happy Hour Policy Discussion in Athens at 5 p.m., in partnership with The Arch Conservative. Speakers are Kyle Wingfield, president and CEO of the Georgia Public Policy Foundation, and Jeffrey Dorfman, professor of Economics at the University of Georgia. Hilton Garden Inn Magnolia Ballroom. $10. Wednesday, April 17: “Second Chances 2019,” an 8 a.m. Leadership Breakfast with Georgia Congressman Doug Collins, sponsor of the FIRST STEP Act, to mark Second Chance Month, which celebrates opportunities for those who have paid their debt to society. Georgian Club. $30. Thursday, May 23: “You Can Say That: How Courage Can Defeat Political Correctness,” a noon Policy Briefing Luncheon with David French of the National Review Institute. Georgian Club. $35. 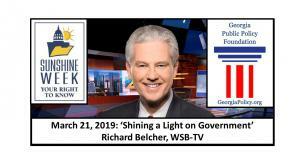 Information and registration for all events can be found on the Georgia Public Policy Foundation's Events page. *Media who wish to attend an event must contact Benita Dodd at 404-256-4050 or benitadodd@georgiapolicy.org.